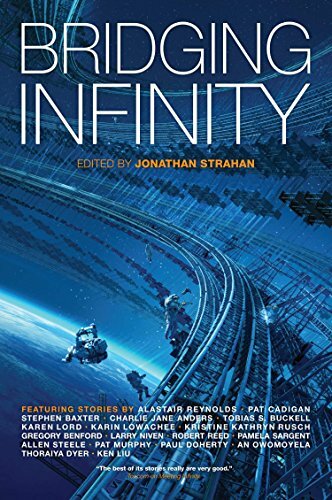 By Carl Slaughter: Prolific and award-winning anthology editor Jonathan Strahan continues his Infinity Project. Engineering Infinity, Edge of Infinity, Reach for Infinity, and Meeting Infinity were followed by Bridging Infinity this past November. Infinity Wars is due out in September 2017 and Infinity’s End in 2018. The series emphasizes hard science, grand scale science, and far-fetched science. On his Coode Street blog last November, Strahan ran a series of brief interviews with many of Bridging Infinity’s authors. Here are some excerpts, with links to the complete posts. This entry was posted in Like Show Business and tagged Carl Slaughter, Jonathan Strahan by Mike Glyer. Bookmark the permalink. He is doing outstanding work. I have never read a dud anthology from him; the stories within are always worth reading, often superb. Allen M. Steele is going to be so cross when someone tells him how many sides a pentagon has got….. This looks extremely interesting. I’m not usually a short story fan but this is being added to Mount TBR.